Zhao Mengfu (趙孟頫, 1254–1322), courtesy name Zi’ang (子昂), pseudonyms Songxue (松雪, “Pine Snow”), Oubo (鷗波, “Gull Waves”), and Shuijinggong Daoren (水精宮道人, “Daoist of the Crystal Palace”), was a prince and descendant of the Song Dynasty, and a Chinese scholar, painter, and calligrapher during the Yuan Dynasty (1271–1368). He was a native of Wuxing (吳興, modern Huzhou 湖州, Zhejiang). Though occasionally condemned for having served in the foreign Mongol court as an official in the Hanlin Academy, Zhao Mengfu has been honored as an early master within the tradition of the literati painters, who sought personal expression rather than the representation of nature. In calligraphy, Zhao Mengfu rejected the gentle brushwork of his era in favor of the cruder style of the Jin and Tang dynasties. 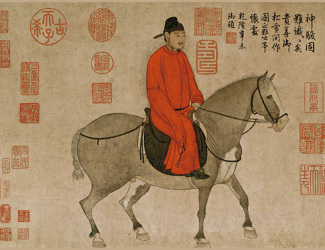 In his early years, Zhao Mengfu studied the style of the Song dynasty emperor Gaozong, but later turned to the styles of Wang Xizhi (王羲之) and Wang Xianzhi (王獻之), in the end studying that of Li Yong (李邕). His Regular Script is considered one of the top four in the Chinese history. The other three Regular Script masters are Yan Zhenqing (顏真卿), Liu Gongquan (柳公權), and Ouyang Xun (歐陽詢). 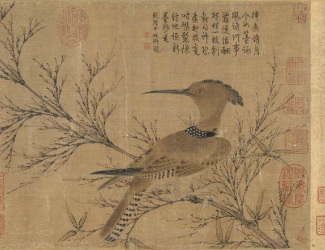 Zhao Mengfu’s paintings were among the first after the collapse of the Song dynasty and its academy of painting to show an interest derived from subjects and styles of ancient masters. 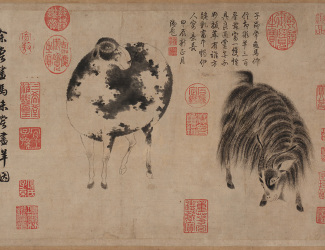 Zhao Mengfu is popularly remembered as a painter of horses in the manner of the Tang dynasty (618–907) master Han Gan (韓幹), but he also painted other animal groups, landscapes, and bamboos. Referring to the antique, he generally avoided superficial beauty by utilizing deliberately simplified color and compositions and a schematic, even childlike, rendering of forms and scale. His works often display a great variety of brushwork. Among his most famous landscape paintings are Autumn Colors on the Que and Hua Mountains [National Palace Museum, Taipei], Twin Pines, Level Distance [The Metropolitan Museum of Art, New York], and Water Village [The Palace Museum, Beijing]. 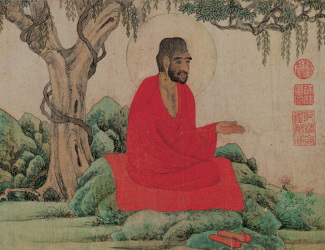 Zhao Mengfu’s wife, Guan Daosheng (管道升, 1262–1319), and his son, Zhao Yong (趙雍, 1289–1360), were both painters of note.